***TXT US @: (419) 362 - 6200*** 3.6L V6, AWD, backup camera, automatic headlights, fog lights, heated mirrors, dual automatic climate control, power windows/locks/mirrors, keyless entry, AM/FM, SiriusXM, auxiliary and USB port, steering wheel mounted audio controls, Bluetooth, tilt and telescopic steering wheel, cruise control, information center, 19" alloy wheels. Warranties: Balance of Dodge's 3 year or 36,000 mile bumper to bumper and 5 year or 60,000 mile powertrain. In service date: 05/31/2018. Extended service contracts available. 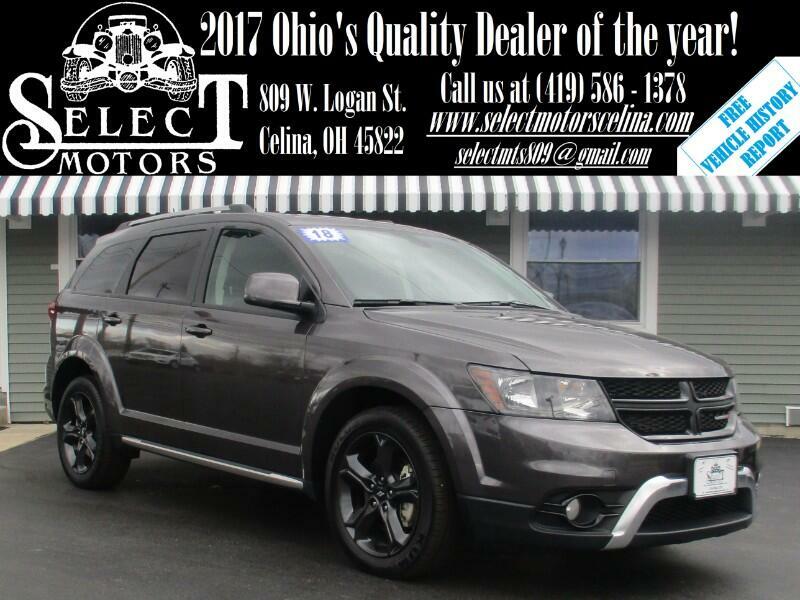 The 2018 Dodge Journey comes in four trim levels, with two engine options and either front-wheel drive or all-wheel drive. The base SE and SXT are pretty bare bones, lacking even bluetooth as a standard feature. Stepping up to the Crossroad gets you many of the same standard features you expect from entry-level trims on other vehicles. The range-topping GT gives you those features plus leather and a standard V6. All four Journey trims come standard with front-wheel drive and, excluding the GT, a 2.4-liter four-cylinder (173 hp, 166 lb-ft of torque) paired with a four-speed automatic. Opting for all-wheel drive (or the front-wheel-drive Journey GT) gets you a 3.6-liter V6 (283 hp, 260 lb-ft of torque) and a six-speed automatic transmission. The V6 is also available as a stand-alone option for the SXT and Journey trims. Standard feature highlights for the Journey SE include 17-inch steel wheels, a height-adjustable driver seat, 60/40-split second-row seats (with slide and recline), dual-zone climate control, keyless ignition and entry, and a six-speaker sound system with a 4.3-inch touchscreen interface. Options packages include the Connectivity package (Bluetooth, satellite radio, a USB port, voice commands and a leather-wrapped steering wheel), the Popular Equipment package (three-zone temperature control with rear-seat vents, a conversation mirror, overhead console storage, and a leather-wrapped steering wheel) and the Comfort/Convenience package (a power-adjustable driver seat). Moving up to the SXT adds 17-inch alloy wheels and contents of the Connectivity and Popular Equipment packages. A Uconnect 8.4-inch touchscreen package gets you the desirable 8.4-inch touchscreen plus adds three-zone automatic climate control, aimable interior lamps, overhead console storage, rear parking sensors and a rearview camera. The SXT's Premium package adds satellite radio, a conversation mirror, leather-wrapped steering wheel and the power-adjustable driver seat. The Dodge Journey Crossroad comes with 19-inch black-painted alloy wheels and the contents of the Uconnect 8.4-inch touchscreen package. Further options include leather upholstery, heated front seats, a rear-seat entertainment system, a premium six-speaker stereo system with subwoofer, navigation, a sunroof and the Driver Convenience package (a rearview camera, rear parking sensors, and a universal garage door opener). The range-topping GT trim gets 19-inch alloys, remote start, a security alarm, leather upholstery, heated front seats and steering wheel, and the premium stereo system. Additional options are largely the same as for the Crossroad, but a Trailer Tow Prep package, which adds a hitch and four-pin wiring connector, is also available.